No Limit Trucking #11 Inc.
Bethany Thomas has a full-time job as an insurance producer at State Farm Insurance. She and her husband, Brett, own and operate No Limit Trucking #11 Inc. in Seaford, Delaware, and Bethany handles the financial portion of the business. Brett handles the day-to-day operations at No Limit. When No Limit Trucking needs a new truck for its fleet, Bethany knows to call Adam Domke at the Stearns Bank Equipment Finance Division to help their business. She has always been able to count on Stearns Bank to provide financing for them at a moment’s notice. 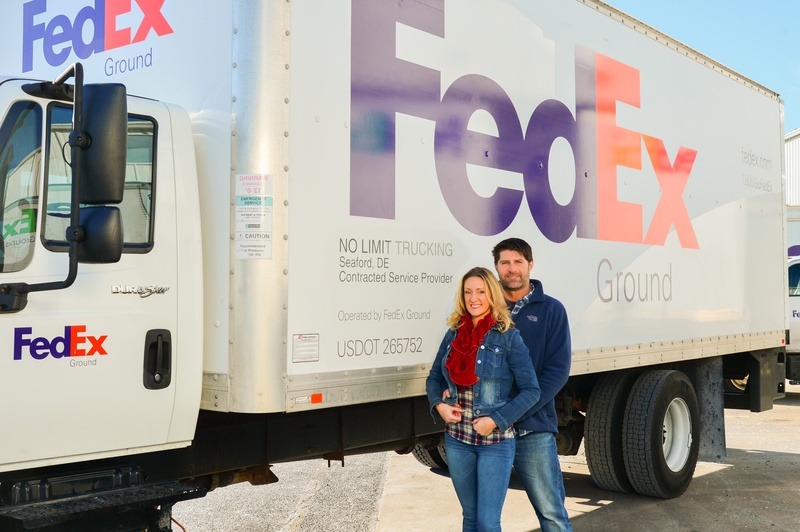 Bethany and Brett have been Stearns Bank customers for five years and have been Fed-Ex contractors for 17. Bethany and Brett were referred to Stearns Bank by an old colleague. Since they don’t have time to waste when they need another truck, the speed and consistency that Stearns Bank provides is always welcomed. Bethany can send an email to Adam needing something and within an hour he has gotten back to her with an answer.